Year 2001 Awards. Read more. The Shearwater 39 has become a classic among cruising designs. For over a decade it was unrivalled as the prettiest production yacht built in South Africa, yet it has a surprising turn of speed combined with its good looks and handling qualities. Over 20 boats have been built to this design and it has developed a reputation unequalled in this country. Now it has a rival. The Shearwater 45 has the same qualities, taken up into the next size bracket. Exquisite interior of "Wave Maiden"
Construction is GRP sandwich using Airex core in the hull and balsa in the deck. Detailing is as for the 39 to maintain the family ties. The hull has a clipper bow, substantial sheer and slight tumblehome aft fairing into a radiused champagne glass stern, good to look at from any angle. The underbody is clean and undistorted with a fine entry, easy midship section and powerful stern. The keel is a moderately long fin and comprises a lead casting bolted to a moulded GRP stub. The stub forms a large sump for collection of bilge water. Characteristics follow the traditions of the smaller sister for performance, easy motion and good manners on all points of sail. The layouts shown are just two of the many options drawn to date. All layouts are based on the mid-engine position with the U-shaped galley positioned over the engine. The benefits are a galley which is easily worked in safety without having to tie in the cook and the best possible engine access for maintenance. Layouts are generally to sleep 4 to 6 in two or three private cabins. Sleeping cabins have been kept compact to give more space over to the living areas of the boat. Sailing rigs are a powerful cutter (in the image of the smaller 39) for all-round performance or a more costly but more easily handled staysail schooner. The schooner rig is traditional North American in appearance, with heavily raked masts. As is normal for schooners, it will be at its best from a fetch to a broad reach. In a design review of the Shearwater 39, Robert Perry, that master of the traditional profile, wrote that the boat "is very beautiful from the stern quarter" and "is a very handsome vessel". In the design of the Shearwater 45, we have preserved those characteristics and others which have endeared her smaller sister to so many. As an investment boat of reasonable size and longlasting worldwide appeal her concept can hardly be bettered. In a sail test of the Shearwater 45 in Yachting Monthly Magazine (Oct'97), James Jermain wrote "This is a stunning looking boat with an impressive performance and delightful manners. Rig options and flexibility of interior design will satisfy the needs of a range of serious-minded cruising yachtsmen." Steve Hunt is the owner of cutter rigged "Maggy May" of Goole. After a crossing from Cape Town to the Caribbean, he wrote:-"I cannot tell you just how impressed I am with the design. On the way up to the Caribbean from Cape Town we saw a couple of rough patches of weather. In one case the steady wind was about 36 kts with gusts over 50. The sea was running quite high, quartering us. The boat was magnificent. I hope you get the message that I am very, very impressed with the design and I thank you for having drawn such a wonderful yacht. The performance and sea kindly qualities of my boat, "Maggy May" of GOOLE are astonishing." 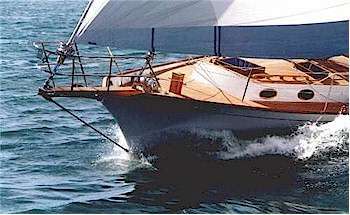 After cruising on his Shearwater 45, Steve Hunt wrote:-"Hi Dudley, I now have 11,000 miles under the keel of Maggy May. I just wanted to tell you what a fabulous yacht she is. Comfortable to live aboard and quite remarkable sailing qualities. Every where we go we accept congratulations on your behalf ..."such beautiful lines" is a fairly usual comment. From those that saw us at sea we hear a lot of "were you motor sailing?" and "what a beautiful stern"... she really does sail very well indeed! !Thanks again Dudley, what a shame they are not in production, best wishes, Steve and Maggy Hunt on board, presently in Antigua." Her smaller sister, the Shearwater 39, fills the same basic concept in a smaller package. Print or download the polar graphs, list of drawings or wood material list for this design.